A coincidence story today which linked up friends unexpectedly. Emerson Curtis from St.Ives in NSW, Australia, and the late film producer, Charles Chauvel, were boyhood friends in Queensland. As children they had grandiose plans for the future, and made a pact that eventually they would travel to the United States together - Chauvel to make movies and Curtis to be an artist. After schooldays they parted company as often happens. 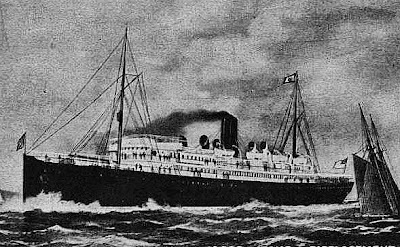 Curtis became an artist, saved his money and booked a second-class passage on the Ventura, which was due to leave Sydney for the United States on April 7, 1922. He wrote to his old friend, to stir him into action. His letter crossed with one fraom Chauvel who wrote that he, too, had booked passage on the Ventura for the same date. Emerson Curtis was amazed as unbelievably, they had even booked berths in the same cabin! Good one! What are the odds? ?